Is Your Pipette’s Volume Range Right for Your Test? Pipettes are one of the most essential and commonly used instruments in labs. They get the term media dispensers after their intrinsic use in transferring measured volumes of reagents. They are like the fuel cells of our labs, constantly and incessantly at work. In this blog post, we shall first learn about the types of pipettes and the distinctive features of each type. We shall then briefly take a look at some best dispensing practices that can help a lab professional make the most out of the pipettes at his/her disposal. Variable volume pipettes are used to transfer and dispense varying amounts of reagents. These pipettes come with an adjustable volume setting that gives the user freedom to work with different volumes. Variable volume pipettes are predominantly used in Molecular Biology, Microbiology, Immunology, Cell Culture, Analytical Chemistry, Biochemistry, Genetics, etc. Fixed volume pipettes are best suited for handling dense or viscous reagents. Since these pipettes dispense the same quantity every time, they expedite lab work without having to constantly alter its volume settings. This substantially reduces the margin of error, unlike the case of variable volume pipettes. Additionally, fixed volume pipettes can be calibrated with greater ease, as there are far fewer internal components than variable volume pipettes. 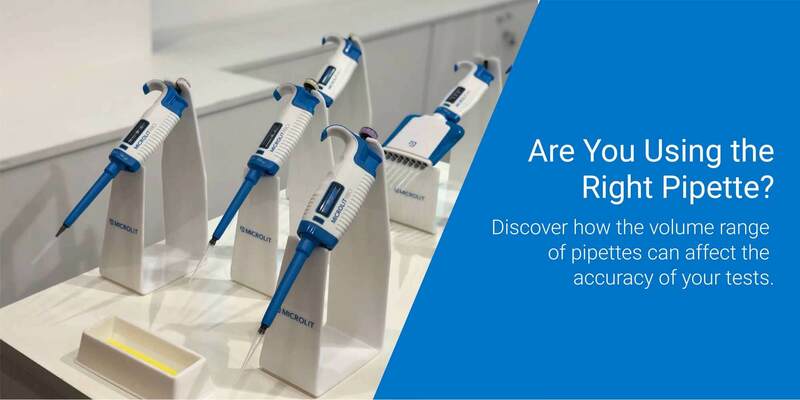 While using pipettes, follow this rule of thumb – select the smallest size pipette for lower volumes and vice versa, in order to achieve the greatest accuracy. Accuracy decreases if one uses large pipettes to dispense small volumes. With small volumes, especially in the 1-10 uL range, it is important to keep a note of the pipetting droplets. In such cases, the droplet needs to be carefully expelled on the side wall to ensure good visibility. However, while adding to a larger volume, the best practice is to flush the tip with the solvent, after expelling the droplet, to ensure correct dispensing of the entire volume of the delivery liquid. Tip Immersion Depth: When it comes to the accuracy of a pipette, a lot depends on how deep has its tip been immersed. Correct tip immersion depth can scale up the accuracy by 5%. Ideally, the tip should be immersed to a depth between 1 and 2 mm for micro-volume pipettes and up to 3-6 mm for normal range pipettes. Faulty immersion compresses the tip’s gas volume, aspirating too much reagent. Last Remaining Droplet: Another crucial aspect of dispensing is to ensure that the last remaining droplet dispenses fully and does not adhere to the tip end. Generally, dispensing with the end of the tip resting against the vessel wall is recommended as it reduces or eliminates the amount of sample that might be left in the tip, increasing the overall accuracy by upto 3%. Immersion Angle of Pipette Tip: It is advised that the immersion angle of the pipette tip should not deviate by more than 20 degrees from the vertical. This is because a horizontal angle causes too much liquid to be drawn into the tip, resulting in increased inaccuracy. Closest Measuring Pipette: Using the closest measuring pipette greatly enhances the pipetting experience and accuracy. Hence, using a 500 ul pipette for a 500 microlitre volume of liquid, instead of the 1 ml pipette is advised because using a pipette with a higher volume to dispense a smaller quantity reduces accuracy.